I came up with the name a couple years ago when creating this blog. My other blog had the name “quixotic faith” and I needed a nickname. “Quixotic” is an exotic word. What does it mean? It essentially means foolishly impractical and idealistic. That’s me! Was me. I was proud of my faith and especially that it was foolishly idealistic. I was willing to believe at all costs. Over time the search for truth and reason out- weighed my desire to believe. This blog was born out of my deconversion. 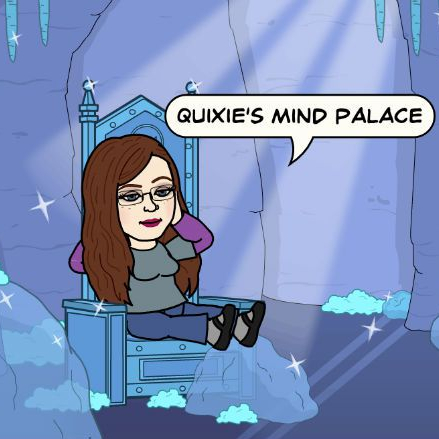 After shaking off the shackles of religion I can now live in line with my own values and truly be “me.” The Quixie personna, and this blog, is great representation of who I now really am. Howdy,ma’am! That’s not my typical greeting but as an American and former Texan I figure I’m allowed to use it. What’s a stereotypical greeting for you Aussies? All I know is G’day mate. What were you doing in Australia? Can’t wait to look at the pictures. Australia is one of the countries I’d really like to visit if I get a chance (hopefully I will)! Well mostly I say, ‘G’day’. Haha, I don’t tend to call people mate. Though I have a friend who does. She’ll say to me ‘hey mate’ And yeah, ‘how ya goin’. Definitely use the ‘ya’ a lot. Terrible we are, can’t be bothered speaking whole words. Anyway, finally found my way over here to your new place. Looks good. And if you make it here to Aus I’m sure you will have a few of us to show you around, eolandeeliva over west (forgive me if I’ve got that wrong) and me over nth east. And I dunno, you got any more of us following you Quixie? I say “ya” a lot too but mostly in the context of “I love ya!” It’s a quick and easy way to express my affection for someone. “Told ya!” is what I tell someone if I was correct about something. Come to think of it Americans are lazy with their words as well! By “more of us” do you mean other Aussies? If so, I don’t know. Maybe other Aussies can give a shout out if they are here? Everyone has their slang, and with the world becoming smaller I think there will be increasing cross overs in terms of usage and it not being typical to location. For example “bro” is used a fair bit here, my sons mate will say ‘hey, bro’. So I’m way all over the place. I can’t get my brain to sort anything into any real order. I’ll leave it there. JJ, your brain is fine. 😛 I hope you are not offended by my saying this but I love your ramblings (sincerely). I’ve always found linguistics fascinating. I’m really interested in American accents and phrases, having lived all over the U.S. and having visited 47 of the 50 states (Alaska, Hawaii, and California are the three left). I think it’s funny that no one thinks they have an accent but everyone does! I also find it amusing that no one can place where I am from. Well, here in the U.S. anyway. If I were abroad I’m pretty sure people would know I’m American. I see what you are saying about the crossover of languages and cultures. That’s what kind of world we live in now — a beautiful hodgepodge. Quixie, this is going to seem a real silly question. But I noticed you said that the avatar you chose bore some resemblance to yourself. I noted the avatar picture seemed to have freckles. Is that part of the resemblance? Just ignore this question if you would rather not answer. I had freckles as a teenager, but they faded away as I got older and tended to keep out of the Sun. You’re welcome! Thanks for being hilarious. You have a fun blog, But it can be hard to figure out how to get your most recent post up in order to comment. I can’t figure out what to click on. Like I can click on to the Christmas one that you did recently, But I can’t figure out how to click on to the one that you just did in order to comment. Thanks for visiting my blog — I’m really honored because I really enjoy yours. About the comments…ugh, how annoying! 😕 When I first started this blog a few people pointed that out and I had forgotten about it, so thanks for reminding me. I need to revisit this issue because I don’t want it to be difficult for others to comment! Once I have access to a PC again (I’m on my phone) I’ll see if I can make some changes to make it work and I’ll comment here.